On Saturday October 13, 2012 The Irish Pastoral Centre will celebrate 25 years of service to the Irish and Irish American communities with friends and well wishers at its annual fundraiser Gala at Florian Hall, 55 Hallet Street, Dorchester. The night promises to be filled with fun, laughter and trips down memory lane. Fr Dan Finn, one of the founders of the IPC, will be the honored guest. The Irish Pastoral Centre is committed to welcoming the ‘stranger among us.’ We believe in justice for all, solidarity in the face of hardship, and that the bonds of community are rooted in the best of what it means to be Irish. We provide a grass roots response to individuals in need offering spiritual, social, legal, and educational support. Run by a dedicated staff, Board of Trustees and a large supporting team of volunteers, the IPC continues to cater to the needs of the Irish Immigrant, in relation to issues on Immigration & Citizenship, counseling on drug and alcohol issues and domestic abuse. 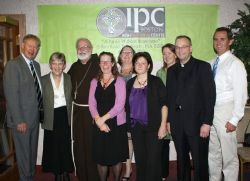 The IPC ministers to the spiritual needs of the Irish and Irish American communities by providing a forum to celebrate Baptisms and Weddings, pre marriage preparation courses, Mass in times of illness or death, home and hospital visits to the elderly and sick, help in times of accident or illness and a bereavement support group. The IPC also has Family Outreach programs to include Mother & Toddler Groups, with the most recent group starting in the Allston/Brighton neighborhood. The Irish Pastoral Centre offers a Senior Citizen Outreach Program where seniors can enjoy a weekly coffee morning in Dorchester at Café Eireann, listening to guest speakers or have their blood pressure checked at the Health Clinic or at the CARA Club in Allston/Brighton neighborhood. Advice is available to seniors with questions on pensions, Medicare and even returning to live in Ireland. A monthly Mass & Luncheon is co-hosted at the Irish Cultural Centre of NE where transportation is provided on a first come first serve basis. Pastoral care is offered to house bound elders living at home, in a nursing home or in an assisted living community.